5 mega-pixel camera, digitial TV, DVD video capture and 16GB memory, for a true multimedia experience. Explore and capture the world around you. Built in GPS works in conjunction with the 5 mega-pixel camera to automatically geotag your photographs. Store not only the date/time but the location for each photograph automatically and seamlessly. Auto-focus, Carl Zeiss optics and a high intensity dual LED flash combine to create photographs with exceptional clarity. Immerse yourself in entertainment. The brilliant 2.8" high resolution display lets you view your videos and photographs in stunning detail. 16GB of on board storage allows you to take your collection of high-definition movies with you. >Experience DVD quality video capture. Record video at high resolution VGA (640 x 480 pixels) and at a smooth 30 frames per second. Digital video stabilization ensures smooth steady video capture reducing unwanted shake whilst the video photo light allows night time recording. Built in TV out option allows you to connect your Nokia N96 directly to a TV for watching your movies on the big screen. Watch TV without a TV. 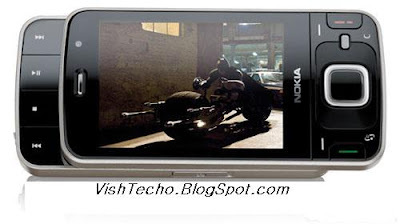 DVB-H support brings digital TV directly to your Nokia N96. Where available, DVB-H brings your favourite TV's shows and channels to watch on the go. Take your music with you. Built in 16GB of storage and expandable memory lets you carry over 6000 songs in your pocket. Hear a song you like? Download and buy songs instantly on your Nokia N96. Stereo FM radio lets you listen to your favourite music stations and talk shows. Find new places around you. Assisted GPS (AGPS) technology and Nokia Maps provides free downloadable maps and satellite imagery for over 150 countries around the world. Find your way whether your driving or walking on foot. Location based services lets you find cash machines, shops, restaurants, bars and useful locations near you automatically when you need them. Internet: Carry the internet in your hand. Nokia Web Browser with Mini Map technology displays complete websites. Support for HTML, Java script & Flash bring a rich multimedia internet directly onto your phone. - Supported formats: MP3, AAC, eAAC+ & WMA. Nice blog. I like the vibe.